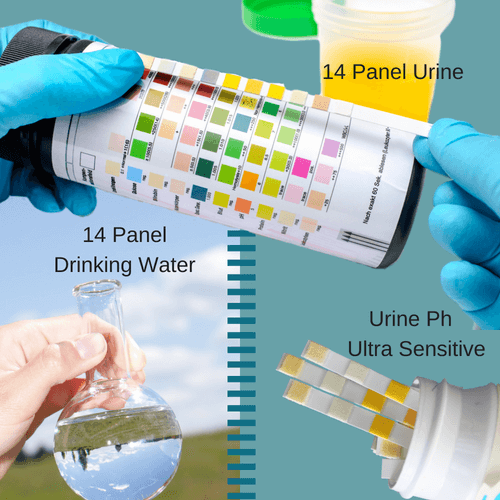 Track a variety of health concerns with this all inclusive pack of pH, Urine, and Water test strips! These are the perfect complement to hair analysis to monitor various health components. These strips are all easy to use and while they can also be purchased separately, each offer their own unique benefits. The pH tests include a Urine Alkaline Food Test, Urine Acid Food Test, Saliva Test, and Lemon Saliva Test used to help discover the body's electrolyte deficiencies. pH tests should be performed at least two hours after eating. Compare the color on the strip to the closest match on the bottle. Read through the pH Test Strips description to learn exactly how to do each test and what the levels mean. We recommend adding Healthy Salt into your diet to increase the body's mineral reserve and pH. This is a nutritious and tasty way to provide the body with minerals, while also alkalizing, energizing, detoxifying, and hydrating. The URS-14 strips require a urine sample to produce 14-1 results. These reveal the levels in your urine of: ketone, bilirubin, leukocytes, nitrite, urobilinogen, protein, creatinine, calcium, pH, blood, glucose, specific gravity, microalbumin, and ascorbate. To use, you simply put the strip in urine mid-stream for 1-2 seconds, shake to remove excess liquid, wait 15 seconds, then compare the color on the test strip to the bottle's color chart. Read through the URS-14 Urine Test Strips description to learn the significance of each parameter found in the urine. The water strips help to evaluate the quality and cleanliness of the water you drink. Just a single dip uncovers information regarding contaminants and impurities found in your water. To use, dip a strip into water and immediately remove, hold strip horizontally for about 60 seconds, then compare against the color chart. If your water is contaminated, filter your water or find another source for clean water. We highly recommend the Berkey Water Filter Systems for effective removal of waterborne contaminates, or natural spring water. Read through the Water Test Strips description to learn what parameters the strips test for.